(Ethics) We were asked to create a timetable to make us have a look at when we complete work, our free time and when we attend lessons. This gave me an insight to how much free time I have in which I could be completing work instead of just messing around. 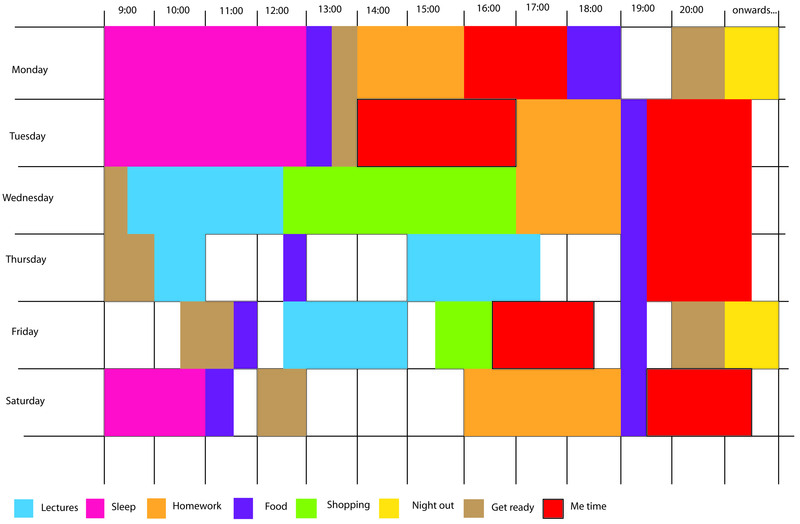 We created this using Illustrator and planned out the times and days so I could look at my time. This is what I came up with, I highlighted each thing I did with a different colour and kept a plan at the bottom so I could see when I did this. In the second part of the lesson, we looked at a series of images which we discussed about being ethical or unethical to send to a magazine or a website to produce. This encourage class debate which got us all talking and helped us to understand more about whether a journalist should have to have consent to use a photo or whether they should just go for it. (Photography) I missed this lecture due to the fact that Liba Taylor was doing her own lecture and workshop. I picked up on some notes from my friend from the class and learnt that we were being taught about artificial lighting. I learnt the basics such as additional lighting should be added if it is too dull, the contrast is wrong or even the colour tone. Things such as reflectors and flash are good sources of artificial lighting as they help to bring the photo to life. This helped because the focus of our first Photography assignment was all about lighting (Halloween) and now I can apply both natural and artificial together and know how to work with them.